Anyway, when I registered for the Race the Runways a couple of months ago I was hoping to race it again. Last year I had a great race and finally broke the 2 hour mark with a huge PR. However, my coach decided it was just going to be a zone 2 training run. I was definitely disappointed when I read my TrainingPeaks, but when I woke on Saturday morning I was definitely excited not to be racing because the weather was not ideal. Saturday’s weather was rather horrendous. I considered staying home. I barely slept Thursday and Friday night plus my tummy was all upset (probably the beginning stages of my fever?) but I had my pre-race oatmeal and got into my car for the hour drive to Brunswick. 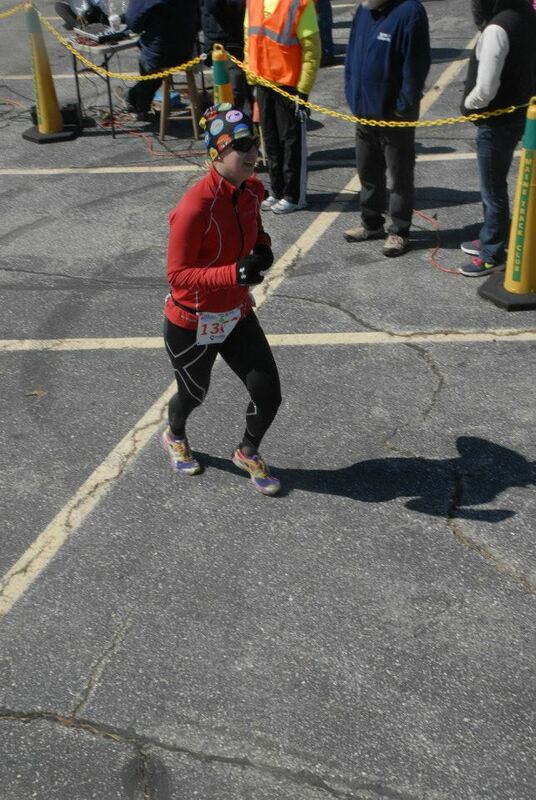 I picked up my race packet and then bee-lined to my car for some warmth until the race started an hour later. I met up with Jen, who I’ll be travelling with down to Jersey in a couple of weeks for the Level 1 Triathlon coaching clinic and who was also running the race as a training run too. We decided that if our paces and heart rate zones matched then we’d run the race together. It was definitely nice to run the race with someone since the conditions were so crappy at least we could laugh about it! Hiding out in the car! 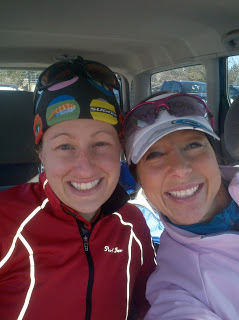 We chatted in the car for a while then pissed behind some big water tank and headed to the start line. No warm-up. Just hovered in the cold wind for 10 minutes or so until the cannon went off. Then we were off! First couple of miles were relatively easy and a lot faster than I thought I was going to be able to run. With all my sickness in the past month my running hasn’t been fast at all, but I felt good. Of course it helps that it’s a flat course. This year the race directors changed the course to try to reduce the wind, but I don’t think they predicted steady wind of 20+ mph with gusts up to 50 mph! You’d be running along at a good clip and all the sudden a huge wind gust would come and pretty much stop you in place. The out and back by the golf course was uneventful. We hit the first and only hill on the course. My heart rate spiked a bit on the hill but that would be expected. I skipped over the aid station because I wasn’t thirsty and then we made the left-hand turn onto the runway for the longest, coldest, and windiest mile of my life. Holy cow was it windy. Last year mile 12 was on the runway and it was windy, but this year’s wind didn’t even compare to last year’s! The wind pretty much ate my heart rate up and spit it out. Our pace dropped from a low-9 minute mile to an almost 10-minute mile pace. I felt like I was barely moving. Eventually we made a right-hand turn off the runway and finally (and I think the only time) got a tailwind! Jen and I joked that we needed a parachute and some roller blades! The middle miles were a two loop out and back route. The wind would come and go. I swear no matter what direction we were going the wind was always a headwind! Mile signs were getting blown over and I’m pretty sure at times people were too! I finally grabbed some water and attempted to eat a gel around mile 6. I only managed about a quarter of my gel. I’m pretty sure it was frozen! I was surprised how many people were wearing shorts too! Crazy I tell you! Our pace at slowed a bit at this point. Heart rate was pretty good. A little higher than it probably should have been, however, now that I have a fever I have a feeling my heart rate was already elevated by the fact my body was trying to fight something. Finish line smile! Thanks to Maine Running Photos! Finally we hit mile 10. Only a 5k left! At this point I was mentally getting bored with the run. The conditions sucked and I just wanted a hot shower. This was my longest run to date this year so my body was starting to feel fatigued. Luckily I had Jen by my side and she kept me in good spirits and moving. We started to head back towards the finish line. The last few miles are through the neighborhoods. The area is fairly well protected with trees and houses so the wind wasn’t too bad. I commented to Jen that it appeared that the wind had died a bit. Yup, I totally jinxed us! Soon after I said that, the wind picked up again. Crap! I got multiple compliments on my sushi hat! Finally, the home stretch. The last two-tenths of a mile were cold and windy! I could see the finish line, but I felt like I was crawling across the finish line! Finally, I crossed the damn line! unfortunately the second shipment of medals didn’t arrive in time for race day so I volunteered to have them mail my medal to me once the shipment arrive. But I did grab a whoopie-pie! After the race I semi-quickly made it back to my car where it was warm and headed home! Overall, it was a good training day. I finished in 2:07. It’s about 10 minutes slower than my PR last year, but that would be expected as my run fitness is lacking lately, it was a training day and not a race day, and the conditions were rough. I guess porta-potties were blowing across the parking lot! I think the day was good for mental prep. It was definitely a tough one and thank goodness for Jen to keep me moving! There were a few moments when I considered bailing, but I prevailed! And now I have the aftermath of a fever to deal with. This entry was posted in 2013, Half marathon, Race, race day, Race report, Race the Runways by kmichaud87. Bookmark the permalink. 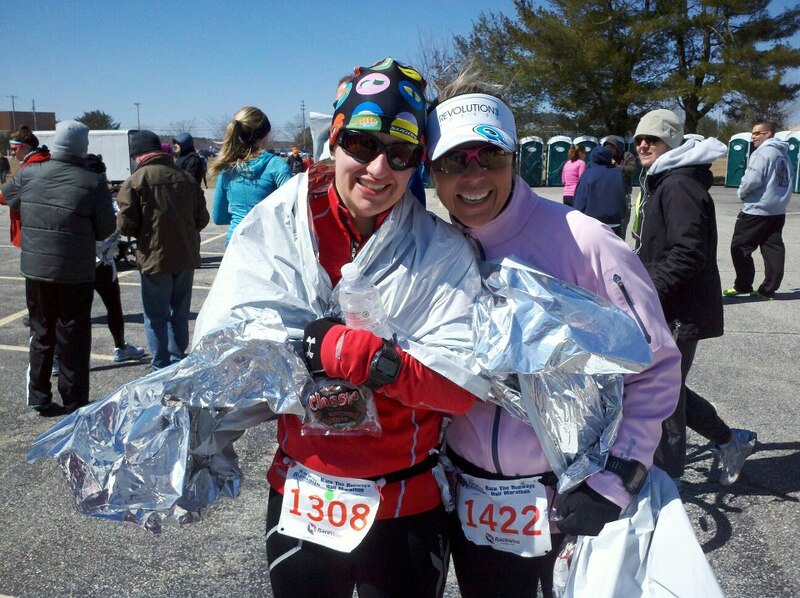 Pingback: Race the Runways 2013 Race Report – Familes who TRI together….